ROCK FOR METAL. Easily the best Pico-8 demo ever made. Truly an excellent piece of code mixed with warrior blood. As I already requested before, there should be a karaoke remix where the lyrics are shown a bit in advance. Easily the best Pico-8 demo ever made. and an amazingly strong solo prod at that! the syncs are tight and there's a lot of clever design ideas everywhere and the track is earworm material with just enough of the metal imagery in the lyrics. Wow, I love this, catchy music synced with lyrics and everything. I watched it twice in a row, rocking my head. Awesome! I'm not a connoisseur of the genre, but the music sounded a bit like B-grade Cadaver. Also didn't really like the "twitchiness" of the tunnel, whether intentional or not. Can't find much else wrong with it. you all should have seen it live with the audience singing. Maybe somebody will upload the video of that. Agreeing with Noby on the tunnel thing, besides that: Chipmetal ftw, this ones spot on! Great, I liked the tunnel and bob part the most, nice tune. A stellar demo. Innovative takes on effects and a lot of true metal spirit. Great coding as well - massive thumbs up! A bunch of cool effects and screens! The lyrics are a fun little touch, well executed too. Porocyon: Damn! Thanks for bringing that to my attention. Which browser is that? I've run into sync issues and other problems with Chrome, myself. New Wave Of Jumalauta! Great stuff all around and best Pico-8 demo indeed this far. Worked better with Pale Moon than Chrome. One million times better than Iron Maiden! Really nice flow and design, and the wireframetunnelthingie in the end was awesome! Now you have the steel and you'll never have to kneel. There is no going back no more. Best Pico-8 demo thus far? This was positively, surprisingly rock. Video of audience singing requested. I love this demo, but there is one thing that has been bothering me and I can't hold it inside anymore. At the end there is NWOJML logo, which is obviously reference to NWOBHM, but singing lead melody all the time reminds me most of Black Sabbath, which isn't NWOBHM, but first wave band. Are there profilic NWOBHM bands known for singing the lead melody technique or is there an error in this fine production? Brothers of True Metal proud and standing tall! Jesus christ, I didn't expect this. Preacher: I got that too, but in my Mozilla's SeaMonkey v2.49.4 web browser. yeeeahhh. Demo is outstanding and the lyrics are from outer space. one of my favourite prods this year! rulez added on the 2018-09-21 12:49:55 by ɧ4ɾɗվ. Hey, sorry for double posting, but I just have to confess that I keep coming back and listening to the tune, over and over again. Watching this one just makes me so happy - it is probably the best demo of 2018 for me. Could someone please provide a link to the FLAC original of the tune? Alternatively, does the demo work correcly on an emulator (at least some emulator exists for pico8) so I could rip it myself? 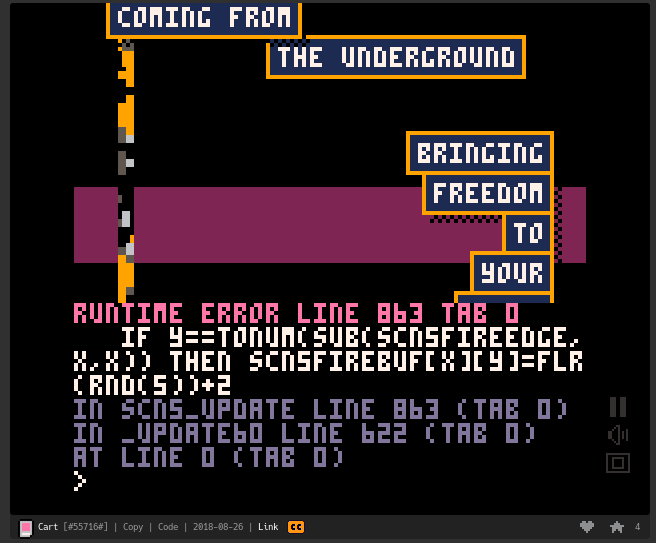 @Warma: PICO-8 is a "fantasy console" so the emulator in this case would simply be your browser. That said, I'd take a FLAC of the soundtrack anytime. If the author doesn't already have it for posting, you can do us a favor. Thank you. This is Culture(tm). "Blood and thunder! Victory at sea!" page created in 0.018081 seconds with 15 queries.